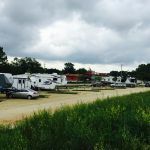 Ask fellow campers about "Chapman Creek RV Park" and nearby attractions. Stayed here for 8 nights. Space was pull thru and very easy to access. Park is gravel, but nice grass and trees between camp sites. The space was pretty level and all the amenities appeared nearly brand new (elec, water, sewer). Picnic table provided. The camp hosts are some of the nicest I have met in my travel. We camped at Chapman Creek RV Park in a Travel Trailer. First time to use a campground. Never did anything like this before. It could not have been a better experience. I knew nothing about hookups, etc. The operator took his time to help me get set up and even directed me while pulling into the space. If I am this way again would not hesitate to stay again! We camped at Chapman Creek RV Park in a Travel Trailer. Thank you so much for taking the time to review our Park. 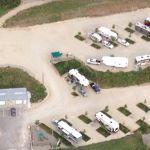 We are so happy your found our campground and hosts to be above standard. We look forward to the chance to have you stay in our park again. Wow! What a gem. We were passing thru on our way to Colorado Springs. This was the perfect overnight stop. Great camp hosts. Excellent Wi-Fi. Right off I-70. There was even a dog park. We travel a lot being full time and we are so grateful to find parks like this. We camped at Chapman Creek RV Park in a Motorhome. 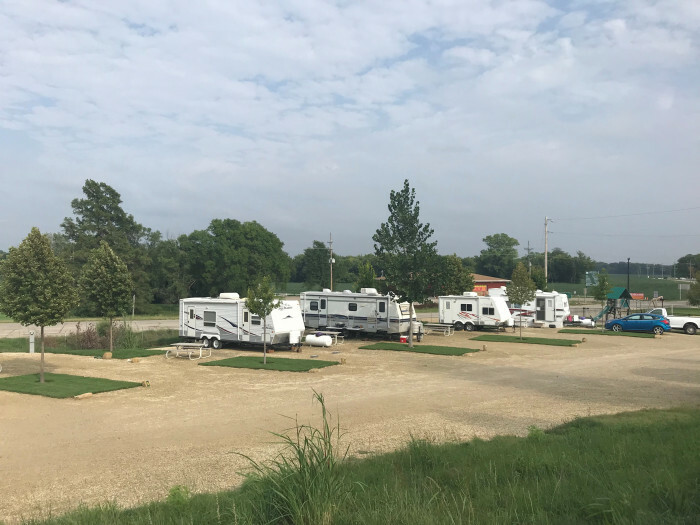 Thank you so much for choosing to stay at Chapman Creek RV Park. We look forward to you staying with us again. Right off of 70; so very convenient. The hosts were some of the nicest we've ever met and the bathrooms and laundry was spotless. AT&T worked good. Even though there's no pool or activities for children (we don't travel with any) it's a great place to stay for a few days. Relaxing and close to shopping if you need to stock up (15 minutes I think). We would definitely stay here again. We camped at Chapman Creek RV Park in a Fifth Wheel. Eisenhower museum is close, as is shopping in general. The camp hosts were extremely friendly and helpful. The restrooms were immaculate. Would stay here again without reservation!! Great job Chapman Creek!!!! We camped at Chapman Creek RV Park in a Travel Trailer. Thank you so much for the wonderful review. We look forward to seeing you again when you are in our area. Please remind me of you leaving a review when you call for your next reservation so that I can thank you as stated in our checkout email. This was the cleanest and neatest camp ground we stayed in on our 2week trip. Great place to stay. The camp hosts were the greatest and very friendly. Thanks. 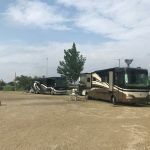 We camped at Chapman Creek RV Park in a Fifth Wheel. Thank you so much for the glowing review. We are glad you had a great time at our park. Please remind us of your leaving a review when you call to make another reservation so that we can thank you as stated in our checkout email. Our second stay here and as fabulous as our first. 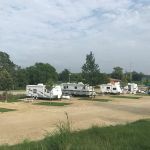 This is a small park easy access from 1-70, great camp hosts, good sized sites, clean and tidy, excellent wifi and the best restrooms we have encountered in our 6 years of RVing. 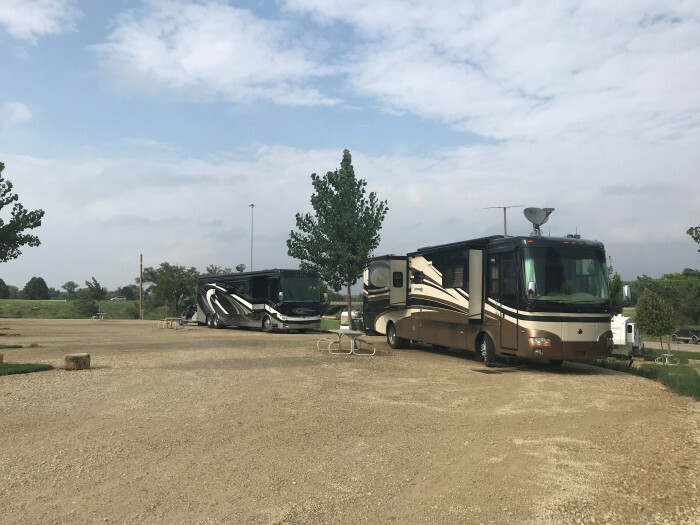 We camped at Chapman Creek RV Park in a Fifth Wheel. We cannot thank you enough for the kind words and repeat stays with us. We love to hear that folks enjoyed their stay enough to be return visitors. We look forward to seeing you again if you are in our area. Safe travels. This park is OK for an overnight stay. 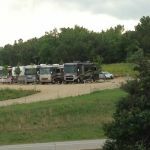 It is a typical gravel lot with small patches of sod and a small tree between each site. Underground sprinklers keep the sod in great shape. It is fine for DishTV reception. Cell phone reception was good, and the WiFi was kind of slow. 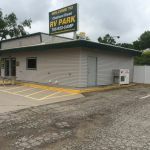 It is very clean and the owners are friendly and helpful. I didn't really like it because even though it is dog friendly, it is not a great place for dogs. The gravel here is sharper and more uncomfortable for dogs to walk on, and there is really no place to walk your dogs except the sharp gravel roads. They do have a small dog park, but it is on a very steep slope and it's too small to play catch. My dogs ended up spending too much time in the RV and not enough time outside. If you don't have dogs, this would be good RV park. If you like to walk your dogs, I would look for another park. We camped at Chapman Creek RV Park in a Motorhome. Thank You for taking the time to review our park. Easy access off main highway. Only stayed one night but convenient. Very friendly staff. Good overnight stay location! We camped at Chapman Creek RV Park in a Travel Trailer. Thank You so much for the great review. We look forward to seeing you again if you are in this area. This is a nice RV park - very neat. We only stayed for one night traveling back home. The only downside was it is very close to the interstate and local road, but that was not a problem for us. The owners were very nice and the bathrooms were immaculate. We camped at Chapman Creek RV Park in a Truck Camper. Stayed one night while passing through. Very clean, easy to get to and very friendly and helpful staff. We would stay here again. We camped at Chapman Creek RV Park in a Motorhome. Thank you for the wonderful review. We look forward to return guests. Please remind us of your review when you make your reservation so we can thank you. This is a smaller park which is very handy to the interstate. The utilities are great and easily accessible. Camp hosts are very friendly and helpful. We camped at Chapman Creek RV Park in a Travel Trailer. Very convenient to Abilene and the Eisenhower library sand museum. Easy on/off from I-70. Owner has obviously spent a ton of money on the park. Stayed one night in a 44 foot class A. If we hadn't been the first one one in parking would have been interesting. 3 pull throughs but they are all in a row. Had to stand on a steep grade and reach down in a hole to hook water up and turn it on. Could be much better with just a little more effort. We camped at Chapman Creek RV Park in a Motorhome. This is a very nice park right off the interstate. Very clean, well maintained, and has a nice dog park. The park personnel are extremely nice. Great place to stop for one night or several. We stayed for four nights while visiting the area. We camped at Chapman Creek RV Park in a Fifth Wheel. Thank you for taking the time to review our park. We hope we get the chance to thank you in person if your travels bring you our direction. Nice, new park conveniently located near the Interstate. We spent 4 nights here primarily to see the Eisenhower Library which is just to the west. Our site was up on the hill looking east. Good satellite hookup and the Verizon signal was good. Camp Hosts were awesome. I had an electrical problem with my coach that required having the shore power post checked and an electrician was there within 15mins. Electrical problem was MY SYSTEM NOT THE PARKS!! At any rate, we would not hesitate to stay here again. We camped at Chapman Creek RV Park in a Motorhome. Eisenhower museum is well worth the time. We took our lunch and spent the day there. Thank you so much for the wonderful review. We look forward to having you stay with us again. Please remind me of your review so we can thank you personally. Obstacles were medium size rocks to protect the automatic sprinklers. Visit Chapman, typical small town "America"
Abilene, the birthplace of Dwight D. Eisenhower and home of his presidential library / museum, is 9 miles west of Chapman. Historical Lindsborg, settled by the Swede's in the mid-1800's, is about an hour away and worth the visit. While there check out the Hoglund Dugout and Coronado Castle for some interesting history. Only 14 miles from the Eisenhower presidential library and museum in Abilene. Have been here a year and still haven't seen all there is to see. Eisenhower Presidential Library is 10 minutes away. It's very close to Milford Lake, this time of year that doesn't matter until spring fishing. There are restaurants, shops, hardware, grocery, etc.. within a mile in Chapman. If you like history, you can be here a year and not get to see it all. We are Kansas State Wildcats and try to go to all the games we can. Fort Riley is a military base close by. We love the movie theater in Junction City, they have big chairs that recline. Walmart in Junction City (10 miles away). Good ATT service in the area. A few restaurants in town about a mile away. Also, in nearby (8 miles) Abilene we ate at a great Mexican restaurant called La Fiesta, and sports bar to watch a football game at Ike's. We went fishing at Milford Reservoir and caught 40 wiper (about 7 lbs. each), what a blast, they are great fighting fish. We stay here for every home Kansas State University game. 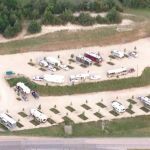 Are you affiliated with Chapman Creek RV Park ?